TOKYO -- Honda Motor Co. forecast a worse-than-expected 65 percent drop in profit for the year to March after natural disasters in Japan and Thailand hammered it harder than its rivals while the strong yen delivered an added blow. Japan's No.3 automaker was the slowest to recover from supply chain disruptions after the earthquake and tsunami in March, while it was alone in having a car factory inundated by historic floods in Thailand, Southeast Asia's export hub. In 2011, Honda's global output dropped by a fifth to 2.91 million cars, slipping below 3 million for the first time in eight years. All other Japanese automakers, except Nissan Motor Co., also built fewer cars, but the declines were far less severe than at Honda. For the business year to March 31, 2012, Honda said it expects operating profit of 200 billion yen ($2.6 billion), hit also by an estimated 8-yen fall in the dollar to 78 yen. The new profit forecast is far short of the 270 billion yen it projected in August before withdrawing that guidance, citing uncertainty over when car production could restart in Thailand. Honda typically provides cautious projections. Consensus forecasts from 24 analysts surveyed by Thomson Reuters put annual operating profit at 283 billion yen. 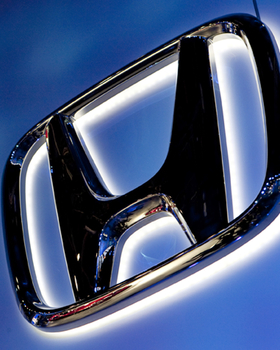 Honda is the first Japanese automaker to report third-quarter earnings. The "third quarter was worse than everybody thought," said CLSA Asia-Pacific Markets analyst, Christopher Richter. "But actually their new guidance does imply a pretty good fourth quarter for them and our expectations are for them to enjoy some pretty robust growth next fiscal year as they recover from the twin disasters of the earthquake and the flood." The Thai floods have hurt other Japanese companies as well. Toshiba on Tuesday posted a 72 percent decline in quarterly operating profit, partly a result of the disaster. Honda, whose bottom-line has been propped up by its leading motorcycle business and strong finance arm, expects annual net profit to fall 60 percent to 215 billion yen. The figure, reported under U.S. accounting standards, includes earnings made in China. With production steadily recovering in the final months of 2011, investors have turned their attention to an anticipated jump in sales as Honda restocks its depleted inventory. Honda said on Tuesday it expects its Thai car factory to be up and running by the end of March, working at full speed in April. It lost an estimated 260,000 vehicles of production globally from supply disruptions caused by the floods, chief financial officer Fumihiko Ike said. So far this year, Honda's stock is the best performer among Japanese automakers, rising 14.2 percent as of Monday. Tokyo's auto sector index has gained 8.9 percent. Still, concern has lingered over whether Honda might be losing its edge after its top-selling Civic got panned in the United States when it was remodeled last year. Competition in the United States is set to heat up this year as resurgent giants Ford Motor Co. and General Motors Co. and South Korea's fast-rising Hyundai Motor Co. flex their muscles in the sedan segment that has been dominated by Honda and Toyota Motor Corp.
For the October-December third quarter, Honda's operating profit fell 65 percent to 44.3 billion yen, far short of an average estimate of 81.2 billion yen in a poll of nine analysts by Reuters. Net profit dropped 41 percent to 47.66 billion yen. "They are not good numbers," said a trader at a foreign bank. "Chances are it will get hit. Honda has outperformed the Core 30," the trader added. "But most of the guys who bought it are long-term guys. We will see how it goes." While acknowledging the criticisms of the revamped Civic, Honda's chief executive, Takanobu Ito, stressed this month that the car had topped the country's compact sedan segment in the latest quarter, outselling Toyota's Corolla. Honda is targeting a 25 percent jump in its U.S. sales this calendar year also by shoring up its struggling Acura premium brand. Before the results were announced, Honda's shares ended down 0.6 percent, while the benchmark Nikkei average ticked up 0.1 percent. Domestic rivals Toyota and Nissan are scheduled to announce third-quarter earnings next week, with Toyota reporting on Feb. 7 and Nissan on Feb. 8.